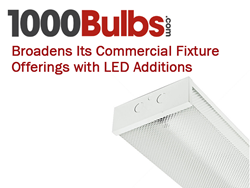 Businesses and commercial customers now have the option of upgrading to LED lighting with new fixture offerings from 1000Bulbs.com. Businesses and commercial customers now have the option of upgrading to LED lighting with new fixture offerings from 1000Bulbs.com. Upgrades to LED fixtures are energy efficient, require less maintenance, and have a longer lifespan than traditional metal halide, high-pressure sodium, or fluorescent lights. From wall packs for the parking lot to lay-in troffers for the office, this new expansion of commercial products brings the energy-saving technology of LED to industrial-grade lighting. LED wall packs are now available in various brands, lens types, finishes, and color temperatures suitable for outdoor lighting. The AC Electronics wall pack consumes only 37 watts while emitting 3,000 lumens of light. With an average lifespan 50,000 hours, it can last twice as long as high pressure sodium wall packs and three times as long as its metal halide predecessors. Furthermore, LED technology has become easier to install; that same LED wall pack can be connected to the existing junction box in less than 10 minutes. For overhead lighting, customers can choose LED lay-in troffers for direct light or LED surface mount wraparound fixtures to deliver all-around illumination. Both options include LED lamps and their compatible drivers in an assortment of configurations like 2-foot to 4-foot lengths or requiring one to four lamps. A variety of styles can add continuity to the office décor. The dimmable Energetic Lighting 2x4 recessed troffer is designed with an elegantly curved reflector to extend the diffusion of its 4,200 lumens and the subtle roundness of the 2-foot Lithonia LED wraparound is Energy Star-qualified in its efficiency. Even the most high-powered lighting can benefit from LED upgrades. High bays in the cool white 4000K color temperature are often used to light retail and commercial environments. TCP’s 4-foot Sky Bay produces an impressive 20,000 lumens while using approximately half the energy of the commonly used 400-watt metal halide fixture. Contact 1000bulbs.com for additional information or to start your upgrade.